Dinner. Now, please. Something, anything quick. Okay, maybe not anything. Flavor matters. We had an early evening, low-energy emergency in the kitchen and there was no plan. Aaaargh! A crisis loomed until I opened the fridge and spotted some crimini mushrooms and dinosaur kale. It had been weeks since my surgery, when RL took over cook and butler duties, and I was SO anxious to return to the kitchen.This simple pasta bowl solved the problem and was surprisingly tasty for an unplanned, no-recipe dish I could handle while moving around on crutches. This so-simple-you-don't-need-a-recipe combination might have been inspired by something I found on pinterest, or maybe a Facebook page, but I couldn't locate it again. Too many pins and posts, too little organization, but no problem. The improv worked out just fine; quick, easy and flavorful, PLUS I got to play briefly in the kitchen. Warm a serving platter or bowl in the oven. 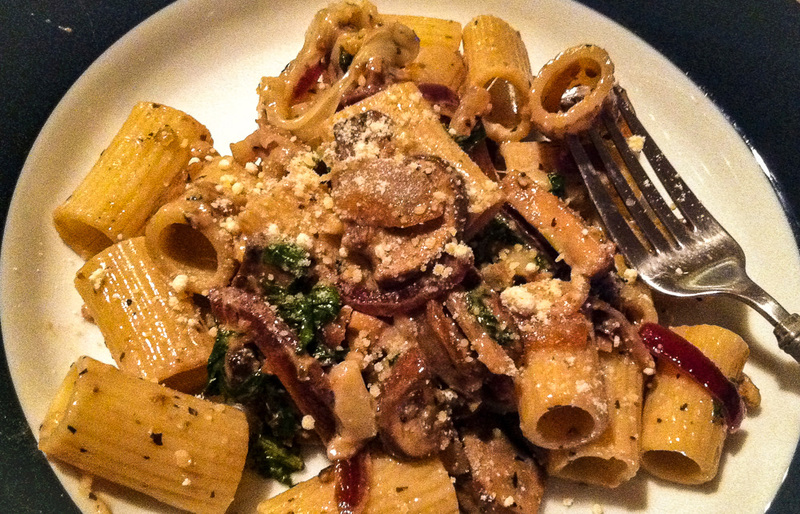 Melt butter in a heavy skillet over medium-high heat; working in batches as necessary, cook mushrooms, onions, Italian herb mix, garlic, salt, and pepper until mushrooms are golden and give up their juices, about 12-15 minutes. Meanwhile, bring a large saucepan of salted water to a boil. Cook pasta until just al dente, about 8 minutes. Drain pasta, reserving 1/2 cup cooking water. Add to the skillet the drained pasta, half of the pasta water, half the ricotta, kale shreds, salt, and pepper and toss to combine. Add more cooking water as needed. Transfer to the heated serving platter and garnish with remaining ricotta, walnut pieces and Parmesan. Drizzle with honey, if you like. Even before opening my eyes I knew, it was going to be one of those days weatherwise. The wind howled outside, rattling the glass and shaking the screens on the sliding glass doors. Rain pelted the windows with a rhythmic rat-a-tat-tat fury. Finally awake and out of bed, I marveled at the three-foot surf racing across the lake to pound against our rock breakwater and roll up onto the small gravel beach. This was a perfect excuse to stay warm and dry inside and make one of our favorite comfort-food soups, pork posole (pozole). The recipe may look lengthy, but it is a shortcut version with remarkably little hands-on time for the cook. 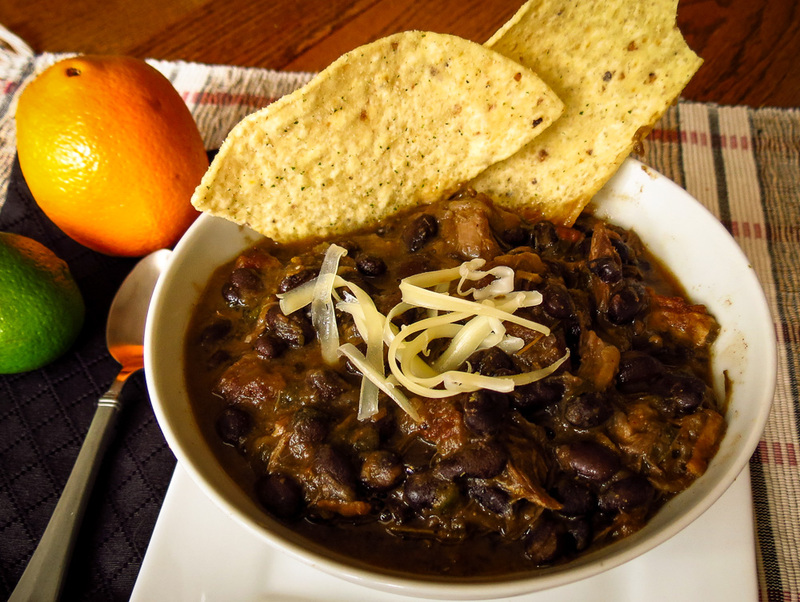 While the meat simmers low and slow in the oven the kitchen smells heavenly, perfumed with Southwest aromas. The aroma alone recalls fond memories of flavorful bowls of posole in New Mexico during SW road trips. More "authentic traditional" posole recipes call for (1) reconstituting and cooking hominy - field corn boiled with slaked lime and dried - and (2) building an ancho chile puree from dried peppers that have been toasted, deseeded, soaked and pureed. Not necessary, in my opinion, this quicker version is plenty tasty without requiring a full day of cooking. 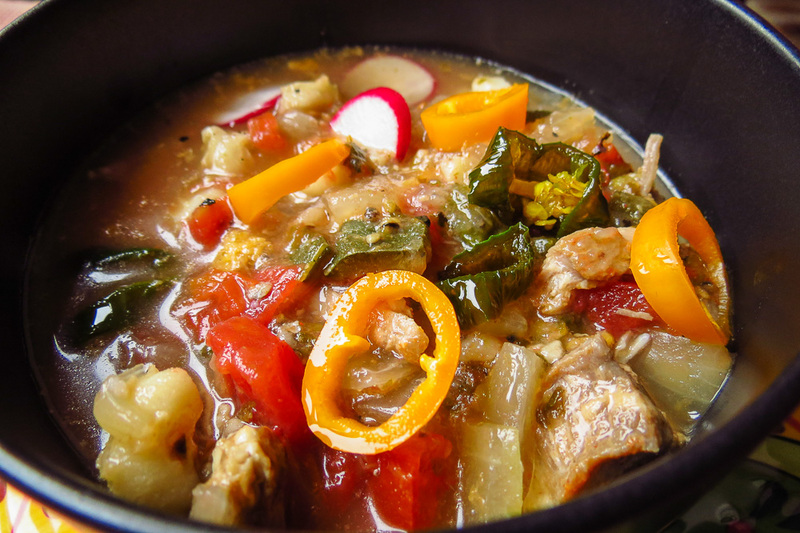 Posole, likened to a soupy stew, is often a celebratory dish in northern New Mexico, offered red, green or Christmas-style during the holidays. 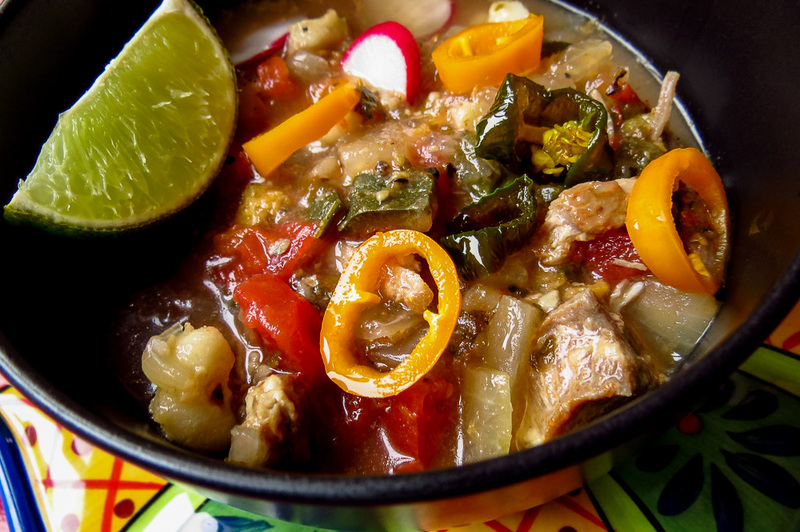 We don't need a holiday or special occasion to enjoy posole at home. Red/rojo or green/verde, served with an array of garnishes, this soup can make any meal seem like a celebration. Not fond of pork? Try this delicious Green Posole with Chicken recipe instead. Or get creative and develop your own version. Place an oven rack in the lower-middle position; heat oven to 300 degrees F. Trim any thick skin and excess chunks of fat from the meat; cut the pork into large pieces of varying sizes along the lines of the muscles. Cut away the bones if using shoulder roast or steaks, but reserve and set aside. Generously season the meat with salt and pepper on both sides. Heat the oil in a large, heavy-bottomed Dutch oven over medium heat. Cook the onions and poblanos until softened, but not browned, 3-5 minutes. Stir in the garlic and cook until fragrant, about 1 minute. Use a slotted spoon to remove the onion/poblano mix and set aside in a bowl. Add a single layer of meat and bones to the pot and cook until the pork is no longer pink on the outside surfaces but not crisp and browned. Use a slotted spoon to remove to a bowl and repeat with the remaining meat in several batches as needed. Return the meat and bones to the pan; add tomatoes and their juices, oregano, cilantro, chicken broth, green Tabasco and a generous pinch of salt. Bring to a simmer and skim off any ugly gray scum (while it doesn’t affect the taste much, it looks unsavory). Add the softened onion/poblano mix to the pot; cover and cook in the preheated 300 degree F oven until the meat is tender, typically 90-120 minutes. When the meat is cooked tender enough to shred with two forks, remove the pot from the oven and remove the meat and bones from the pot. Add the drained and rinsed hominy to the broth; cover and bring to a simmer over medium-low heat. Cook until hominy heats through and the flavors blend, about 30 minutes. While the hominy cooks, use two forks or your fingers to shred the meat into bite-size pieces. Discard the bones and any large strands or chunks of fat. Return the shredded meat to the pot and simmer until heated, about 10 minutes. Taste and adjust seasonings (usually salt and hot sauce in my kitchen). 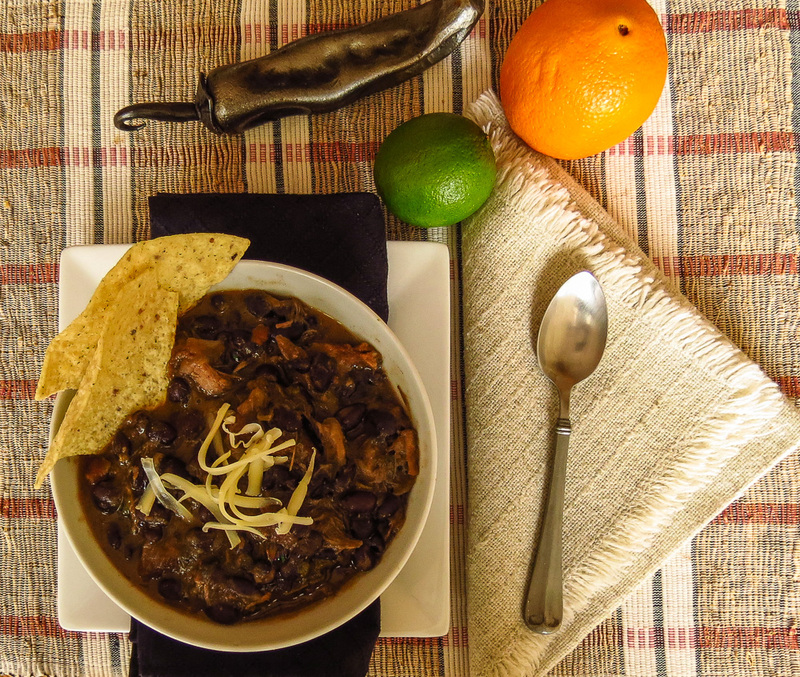 Spoon off any excess fat that arises to the top if you are serving the posole immediately. Or refrigerate and remove congealed fat before reheating at a later time. Ladle the soup into individual warmed bowls and serve immediately with a variety of garnishes. It's always interesting to see what the husband brings home from the grocery store, even when sent with a list. I organize the desired items by department - produce, dairy, meat, frozen, bakery, etc. - but we can still end up with a few surprises. "Sprouts", for example. I had bean sprouts in mind but he came home with Brussels sprouts instead. Oops, I should have been more specific. Quick, revise the dinner menu! "Steaks" were intended to be the beef strip loins that were on sale, but he found a great pork bargain of Buy One, Get Two Free. Suddenly we had a lot of pork shoulder on hand. This impromptu soup was inspired by his recent shopping adventure. Yum, it was welcome comfort food on a stormy Seattle afternoon. Add oil to a heavy-bottomed Dutch oven and heat to shimmering over medium-high heat. Add the pork in several batches to avoid crowding and brown on both sides. Remove to a plate or bowl and sprinkle with salt and pepper. Add the onion, pepper slices and garlic to the pot; stir until fragrant; cover and sweat for 5 minutes over medium heat. Uncover and return meat to the pot. Add the next 6 ingredients, oregano through oranges, to the pot and stir to combine. Cook in preheated 325 F oven for 2 hours or until meat is tender. Stir in the beans and return to the oven to heat through (or use the stovetop). Add more broth if you prefer a soupier soup. Taste and adjust seasonings. This soup definitely gains in flavor after resting and reheating.